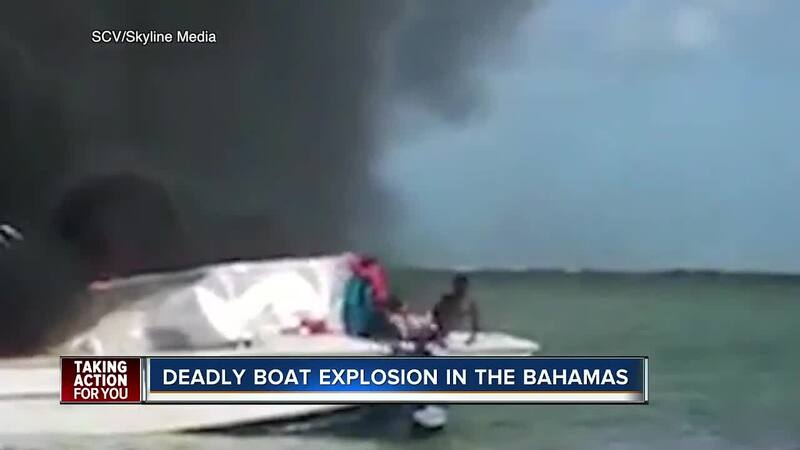 PINELLAS COUNTY, Fla. — Authorities confirmed an American tourist died in a fiery explosion on a small tour boat in the Bahamas Saturday morning. Nine others were injured. In a press release from the U.S. Coast Guard, officials said four Americans were flown to St. Petersburg/Clearwater International Airport. Video shot by onlookers showed the aftermath of the explosion. Three people on the neighboring boat jumped into the shallow waters and helped to pull at least one injured person off the disabled boat. In a Facebook post by Exumas and Ragged Island MP Chester Cooper, he said two other Americans were listed in "extremely critical condition."